Wasp nests that is! 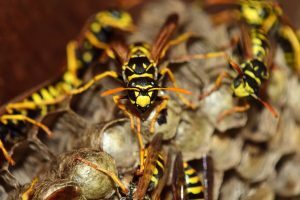 Fall in Phoenix brings lots of need for wasp nest removal. Yellow jackets and mud-daubers give homeowners the biggest problems. Large (nuclear nests) will spawn many (satellite nests) thus the heading for this blog. So a thorough property inspection is in order for any wasp problem. We recently found seven wasp nests on one property, hiding in tall grass. They also like to nest in thick bushes, ivy and any location that gives them good cover such as roof and patio covers. They seek cover from the elements just like us. Wasps are carnivores, that is they’re meat eaters. Small bugs, grubs, moth eggs, larvae and worms are on the daily menu. Although they are pollinators there is no honey produced by these pests. They rely on the same essentials we do – shelter, food and water. Like honey bees at the water’s edge, wasps are harmless. Only around their nests will they take a very defensive posture. The right time of day to exterminate is crucial for a proper wasp job. Sunrise or after the sun has set will insure all critters are at the nest for a proper removal. ASAP Bee Removal will inspect your entire property including exterior home, out buildings, landscape, and property fence boundaries, exterminate and remove any nests and give the homeowner a 20-day entire property guarantee from date of the job. Most pest control companies will not give you, the customer, a guarantee on flying/stinging insects. So feel free to call A.S.A.P. Bee Removal at 602-751-1002 regarding your wasp or honeybee problems.